Amy Linden is a dental assistant at Langworthy Family Dental. 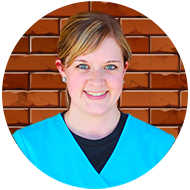 Amy joined the Langworthy team in 2010, shortly after graduating from NICC’s Dental Assisting program. She started out assisting Dr. Emily, but now you will mainly find her assisting in our hygiene department. Amy enjoys keeping busy and doing a variety of tasks that help our hygiene department run smoothly. When not keeping our hygienist’s happy, you can find her rooting on the Dallas Cowboys, spending time with family and friends, and spoiling her stepson, Atreyu. Amy lives in Epworth, IA with her husband, Adam, stepson, Atreyu and dog, Charlie.